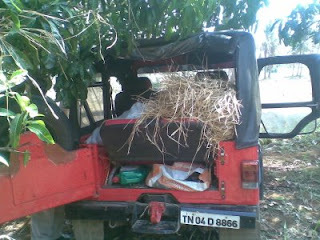 Finally I will have a shelter in my farm to take rest. 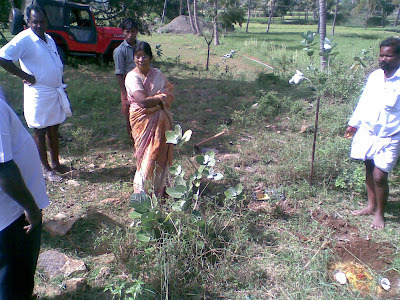 Yes, last weekend we conducted a bhoomi pooja to built a simple Asbestos cement sheet house in the farm to take rest whenever I visit the farm. The shelter will also provide room to park as much as 4 of my four wheelers. hmmm good now more vehicles could be purchased. I basically need place to store my farm outcomes and the equipments. Hence this small house in the farm. Another 20 days we will have house ready in the farm. Hurray Farm House is exciting! I'm gonna have a small children gymnasium, BBQ facility and personal offroad ground in the farm very soon. 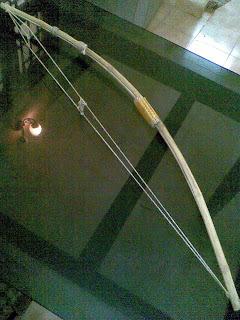 While I was offroading at Jawadhu forest range last week I met a hunter or villager at forest, He had a real bow after a hour long chat with the guy, He turned to me a friend and gifted his Bow to me. 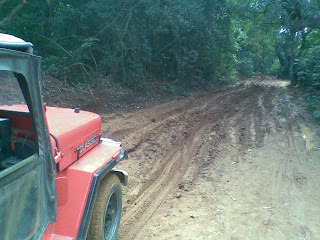 The trip to Jawadhu is always impressing and lots of water in the Bheema Falls, we had good offroad fun too. 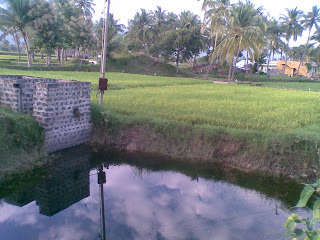 On the way back I touched base with my farm at the bottom of the hills and to my surprise the well in my farm was filled with water and near to overflow condition. It was excellent experience a 4 day long self driven journey to Kerala state head quarters(Trivandrum) from Tamil nadu state headquarters(Chennai). I was selling my Yamaha RD350 legendary bike to a keralite as my bike beard the KL number plate. 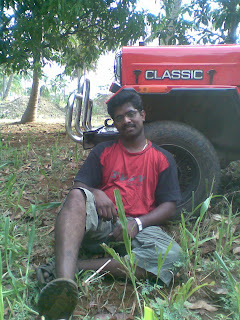 At the same time I promised my friend Shibu that I will handover his Jeep restored by me at his home town. 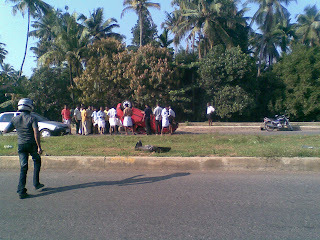 Hence I was in a situation to drive both the vehicles from Chennai to Trivandrum. 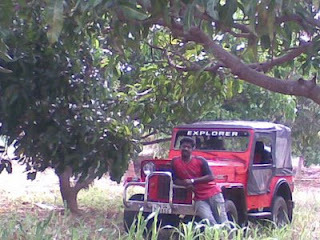 There was another purpose on this trip to drop my kids at my hometown hence with the help of my Jeep/RD350 mechanic Bharani I started my longest journey. The entire trip was covered above 2400kms including return but the 1178kms is the best experience as I was riding the bike or driving the Jeep continually. 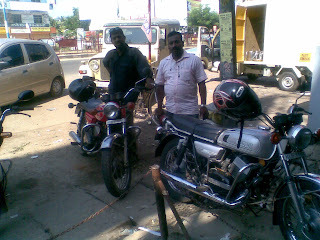 Good experience of Bike failures and fix, Jeep thrill and what else met all my good friends one among was Mr.Muthukumar from Coimbatore who restored and possesses huge sum of vintage beauties. 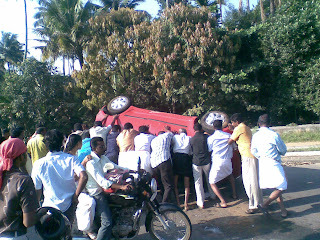 There was a horrible accident before my eyes in Kerala made my day bit sad as the driver was kill instantly on that incident. 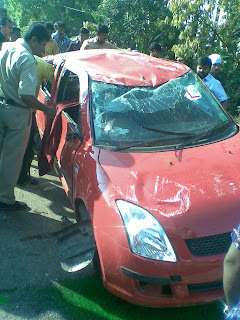 It was a Maruti Swift which had to face to fate with road divider and rolled couple of times before landed upside down on the opposite track last lane. For any company or work place with more than 2 employees requires greater amount of co-operation among each other to produce extraordinary outputs. Hence a team with 100+ people and all of them are professionals, hmmm a major reason to look at team building activities as source of people integration technique. There is no patriotic song that we sing together, there is no color that unites us, there is no religion that we share, there are no common skills among us but we all are part of an entity called Team. Year after year I get an opportunity to bring all the members of our team together to educate the importance of team work. (Task that I always like so much) But who likes advices, suggestions, trainings and commands? I know it is impossible to make every one to listen to someone’s ideas, but there is still a way to achieve the goal – Team Outing. I’m going to write about the last team outing organizing experience that I had here in HCL, We call it Catalyst program (The very first constraint is Budget). 1. Bring all the people together and make them understand they form a entity called Team and every individual is a stake holder. 4. Integrate the dis-integrated or hierarchical work team. "Freshers and Senior" barriers needs a break here. 5. Maintain utmost safety while handling the tasks assigned, as each one's security and safety are my priority. Come on readers join with me for the world of team-building, I'm proud I had done couple of these exercises. Behind the scenes of Yercaud, the poor man's Ooty trip. It all started in a weekly meeting that our team had. As it was almost an year since we had our team outing to Jawadhu, everyone wanted to go for an outing.Lots of suggestions for places came; but we had many constraints. As our team do diverse set of technology support for 24/7 support requirements to the clients the major constraint is the Time and operational support. I needed to find any place that is close by Chennai city so our entire team could travel and return with minimal disruptions to the support functionality. I was aiming at no disturbance, I must say we had minimal support staff plan at the very first day of the tour discussion. Then came my next constraint, money. The moment we think of any tourist location the accommodation cost shot up to sky level. I needed to organize accommodation, food, and travel plan necessary for taking a huge bunch of people (~ 150). I started working on approximate number of headcounts excluding minimal support staffs, people who cannot travel for personal commitments, customer schedules for few guys, last minute drop outs on illness and unplanned events dropouts. So I had a ball back figure of 75~95 guys on the trip plan sheet.Another major concern is that of what kind of entertainment need to be arranged for chunk of people with diverse interests and hobbies while not forgetting “THE MOTTO” of team outing, that is to build a bonding among the team members. Our discussions went on with the team leaders in planning the minimal operational support staff and area of interest for the team visit. 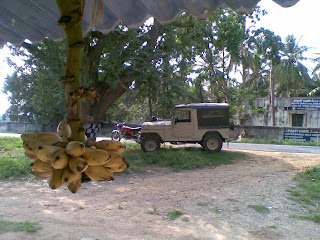 Munnar, Pondicherry and Yercaud are the places we rounded off finally. Munnar being far away we need to work on multiple travel mode which led me to strike off Munnar from the list. The Pondicherry plan also was dropped out as there will not be any major difference between Pondicherry and our home city Chennai. Hmmm so the only left out option is the poor man's Ooty that is Yercaud. I was caught with lots of stress and tension to make the trip a success one, as the total numbers planned was huge and there will be many people with many different expectations. Fulfilling everyone's wishes may not be possible but I wanted to achieve an optimum level of success story. Over all I was looking at every individual for their interest towards the arrangements, except very few in whom I really didn't see any major interest. In fact I was under impression that people are willing to visit as they were compelled by their team leads but I must accept that my assumptions were wrong. I witnessed the trend changing slowly towards the plans after I finalized the place and tentative schedule. The white board in my cabin got filled with list of people who volunteer to participate in the event planned, sooner it was touching 96 number in head count.Looking at the number and overwhelming responses, my tension level was increasing as to find how to make the trip a grand success. Initial search for lodging in Yercaud posted me a threat on the cost as most of the very good resorts were on the really higher side tariff and I really couldnt afford their tariff for accommodation as my budget for individual is not even half of their quote. 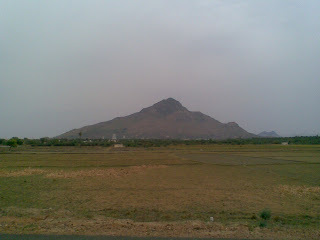 I had found 3 places which are still higher but closer to my estimates, that is the day I came to know one of our colleague is in Salem which is the nearest city to Yercaud. 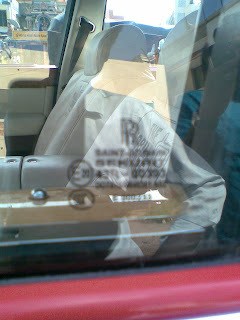 I called and requested him to help me visiting Yercaud to see how the three places I spotted are. He returned the call with not so good kind of response. This is not a good sign, but I still had some hope and finally landed in Yercaud International resort's website, the pictures of their cottages were interesting to me. I called the manager Mr.Shanmugam he said accommodation for these many people are going to be a trouble as many of the rooms were already booked. This is a week before my proposed schedule, so I requested him if he can move his guests to another accommodation and block the entire resort for us. He gently agreed and instantly I transferred the advance money through internet banking. I felt bit easy as the accommodation was set. 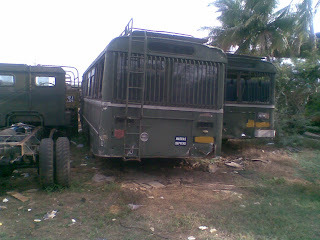 Parallely I had requested couple of my friends at office to get me quotes from various bus operators for the Yercaud plan, the cost of transport was somewhat close to my estimation and the Just dial (directory)service in Chennai came in first hand help providing me so many number of contacts from different bus operators. The Wheels Tours and Travels company agreed to take up our tour requirement and another fund transfer over the internet, second story of success in the team outing plan.We had still few issues on fixing the start time and return time so the order process of food was put on hold. But I had communicated the resort guys that I will confirm number of meals and people a day before our travel plan. Since I was given a responsibility to organize a tour for a huge team of professionals; the travel comfort, hygiene food, neat accommodation, hospitality, water, alcohol plans, medical kits, sight seeing options and fun activities were all in queue to be worked out. I had already started working on individual items and started sending all my findings and ideas on email to all the stake holders of the proposed tour plan. Slowly the plans were on progress and the check list I prepared earlier growing on a satisfactory level. I have tried my level best to include as many people as possible so that issues with single handed failures could be avoided. There were freshers in our team, my solid ideas to include them into the activities worked really good their involvement was phenomenal level and hats off to them. 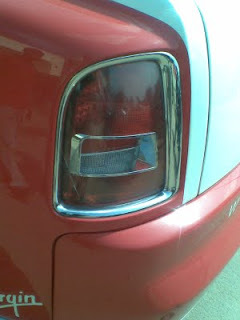 A Date with Rolls Royce only for Rs. 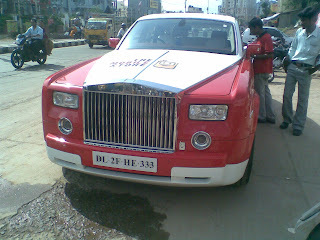 5000 - This is what I felt seeing a beautiful and dream only Rolls Royce standing outside a mobile handset selling shop in Chennai. The retail mobile outlet is a branch of country wide chain store that only sells the mobile handsets. For the past few days I didn't miss to spot the Rolls Roys chassed by cyclist, motorist and even the autorickshaw drivers here in Velachery. 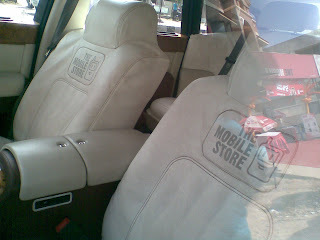 I was always in an impression that the RR was bought by "Mobile Store" owner and he visits this shop. 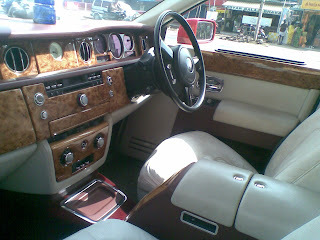 But today I wanted to go closer and take few snaps of the car. 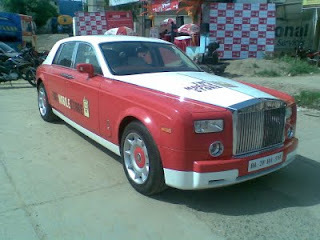 I was surprised to hear from the "Mobile Store" guys this car is for our esteemed customer, !!!?. He said if anyone purchases above Rs.5000 worth stuffs from the shop they will be taken for a joy ride in the ultra super Rolls Royce. 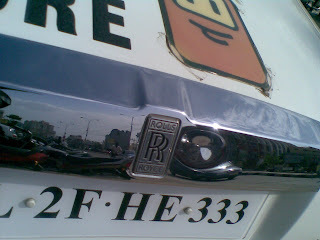 Huh Rs.5000 purchase will let me take a RR ride, Why not? 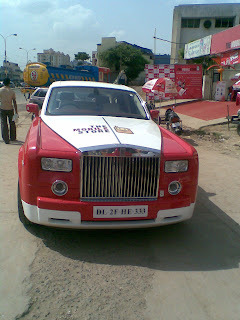 After seeing this car and hearing the reason behind the car standing outside the "Mobile Store", I went and searched internet and found few westerner's post about this RR(http://www.engadgetmobile.com/2008/12/25/rolls-royce-converted-into-mobile-cellphone-store-in-india/). They are mad and it shows their attitute looking at Indian secne at a wrong view point. While many of you are aware and supported me for the TGDC by your votes and testimonials, we were lost at the 2nd round and couldn't make it to the top12. To be honest I was really not sure what is the selection criteria, but I really appreciate the organizers of the even for a successful handling of the TGDC. After I came to know that our names were not included in the TGDC top12 list, disappointment was too high on my mind and after few days I really accepted the reality that only 3 people can drive in the challenge. Me and My wify was talking about this for 2 days after seeing top12, the slowly got into our business. Today when I came back from office, kids showed me 2 parcels and I didn't know what was inside parcel as there was no information about the orgination. 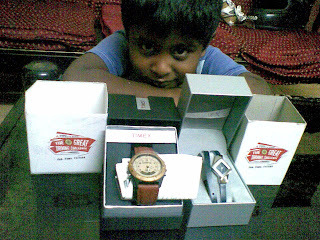 I slowly opended the parcel and found a beautify ladies watch, and the second parcel contained a smart Timex gents watch. Both the watch boxes had TGDC logo and hurray now we are bit happy. Thanks to TGDC. Today is another baby's day out. 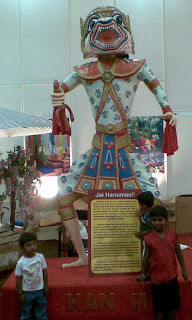 Me and the kiddos at home have paid visit to the Chennai Trade center. You must be asking me what was there? 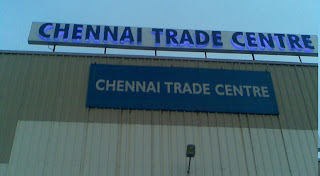 yes, the Chennai trade center is largest exhibition infrastructure in Chennai. 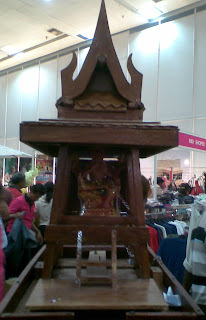 Today it was Tourism related exhibition by Thailand Tourism board. What a beautiful country it is, I have decided to visit Thailand very soon. The people of that country is beautiful. I like their buildings, dance and people. What more is required to get attracted for a country. I'm for game, Thailand is in my top list for country to be visited. 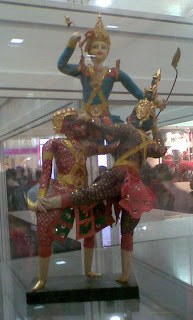 The special Thailand cultural dance program organized in the exhibition attracted many people. What a pretty girls the Thailand females. 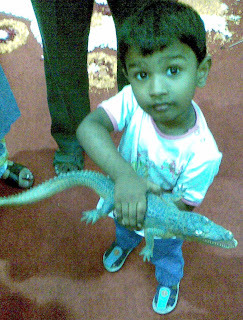 Kids got replica of reptiles such as crocodile and snake. 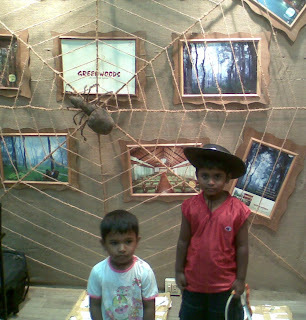 They looked almost realistic and many at the exhibition hall wondered how the kids carried such a deadly reptiles. 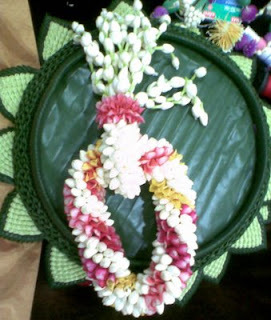 There were couple of other stalls, one of such stall demonstrated how to add the flowers into string in a nice way to the visitors. 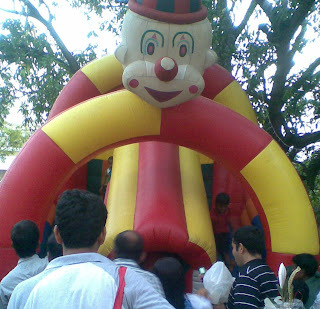 outside the exhibition hall, the sponsers installed the kids play area and yeah it was sure a blast for my kids. 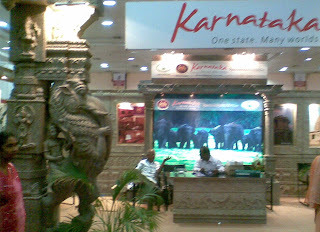 Alongside the Thailand exhibition, the Indian Tourism Industry also put up stalls for various Indian states and their regional attraction. 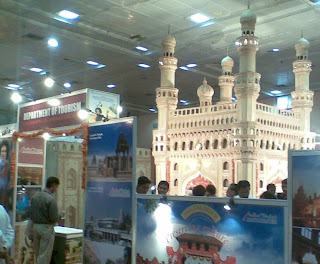 This part of the trade center was more colorful with the stalls organized with replicas of their special building architectures. Also, the creative designing of the few hotel resorts and holiday clubs proved it to attract kids. Yesss! We have made it to the TOP 100 winner's list on the Mitsubishi-Cedia Great Driving Challenge. 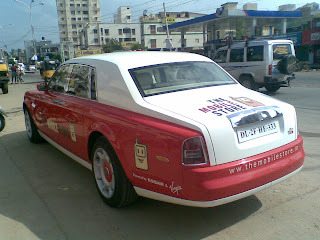 It was great day today after I saw the www.greatdrivingchallenge.com site. Our names were listed as part of the top 100 selection list that was announced. Yaaahooooo! It was a great way of presenting the topper list, the organizers arranged selection list hidden behind the announcement (each letter to hide one couple on the announcement), I thought I will be in the last few letters if at all we were selected, hence started to looking at all the pictures from bottom to top. To my surprise our profile was hidden behind the letter "E" in the first line itself. I must thank you for all your support. We're too much excited to Drive the 3000 kilometer challenge. I'm hoping our application get selected for the top 3 so we get the chance. Anyway we still have one more stage to cross. Keep supporting us, till we complete the drive challenge. 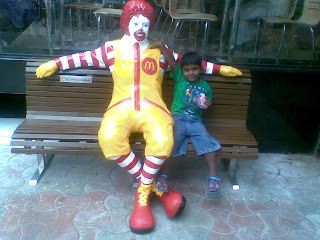 After a short break at the newly opened McDonald outlet in Anna Nagar along with my son here in Chennai I was visiting the local Army scrap yard last weekend with my friends and my son searching for few Jeep parts. 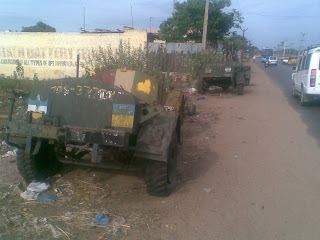 In fact the parts we searched are for a Ex-Army (scrapped) Mahindra MM 550XDB Jeep. 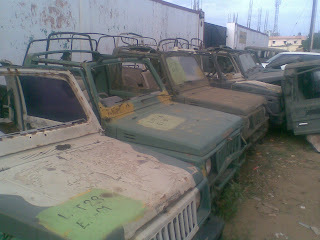 What a sight on the scrap yard, we have witnessed a wide range of military vehicles scraped in the yard. My friend Shibu from Dubai had a very interesting visit as the scrap yard offered a wide range of military application exhibition. 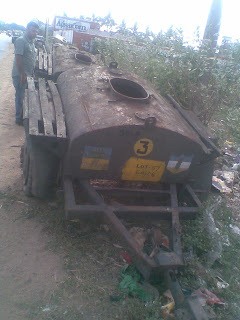 I was impressed to see a tank like armored vehicle with huge tires. If I have chance I would like to at least sit inside the vehicle and feel how the army personal drive the giant tank. 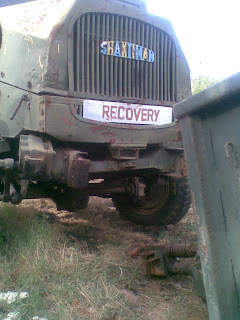 The complete Army recovery vehicles are impressive with the Power Take Off winch to operate the recovery gears. 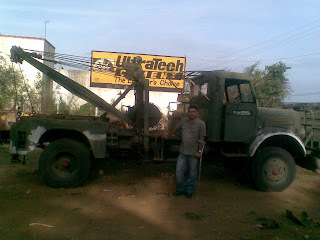 Shibu took a quick picture infront of the recovery vehicle. 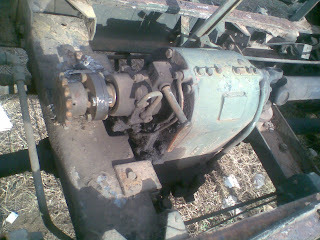 The sakthiman truck's gearbox gave a feast, we got to see the close look of the sakthiman truck's gearbox with 3 drive shafts and 1 sproket to drive PTO unit. 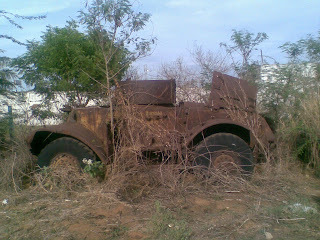 One of the drive shaft powered the gearbox from engine and two were used for front and rear wheel movements. 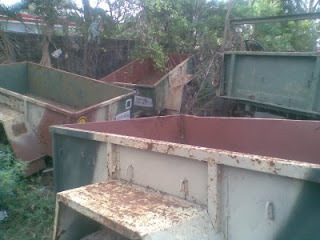 After a brief time we extended our farewell to the open Army Scrap Yard. Cast your vote for us to The Great Driving Challenge !! We are Planning to participate into the Great Driving Challenge even organized by Mitsubishi. The trick is that I need to gather votes and testimonials in order to get my chances on the higher side. Unfortunately I know none other than you my blog readers to support me. Hence I'm requesting all the blog readers to find your time to cast your vote for me and my wife for the challenge. Click on the link below to support your friends for the driveaway. Once you see the page, record your vote and testimonial. Let me see if I'm progressing on the vote rank. Thanks for voting! WoW looking at the route I have planned shows me the joy drive that we are going to have. I'm thinking of the Chennai-Bangalore-Mysore highway drive, Bangalore Traffic Drive which is going to put sure stress on my arms, Mysore-Wayanad-Mangalore Forestry safari, Mangalore-GOA Coastal and Congan cruise, Most adventures curves of Goa-Pune road while we set our self into the Spicy food fiesta travel in the lands of Andra Pradesh. Overall we are ahead of whole of South India states tour and our path covers Tamilnadu (Chennai), Karnataka (Bangalore, Mysore, Mangalore),Kerala (Wayanad) and Andhra Pradesh (Hydrabad). 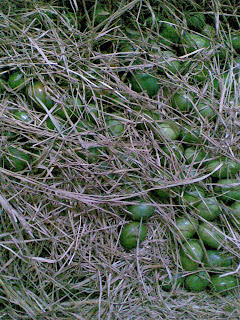 I can't really resist to show my excitement, this is really going to be break to our work life.